One week it’s in the 60’s… the next it’s in the 90’s. 95* currently to be exact. But don’t worry… it’ll be back in the 60’s by Thursday so I guess it’s just time to enjoy the heat while it lasts, which is exactly what I did. I met up with a friend this morning and we headed to the beach in Milwaukee, even seeing a TV anchor taping all of the beach-goers. I made sure to put on plenty of sunscreen to not look like a giant tomato during an interview I have tomorrow – and so far I’m looking alright! If you’re experiencing any kind of heat similar to what I’m experiencing here in Wisconsin today, I bet that drink is looking mighty tasty up above! 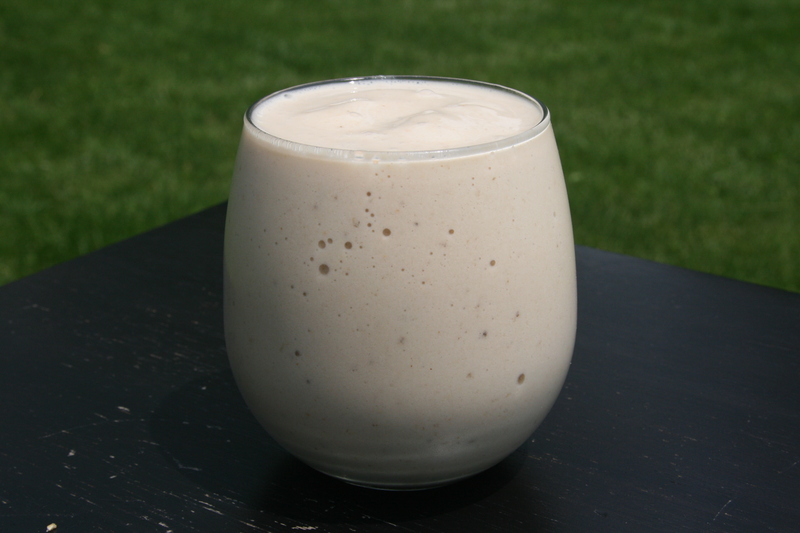 Don’t worry, I’ll provide the super simple recipe below for this wonderful smoothie to get you through the hottest of days :). 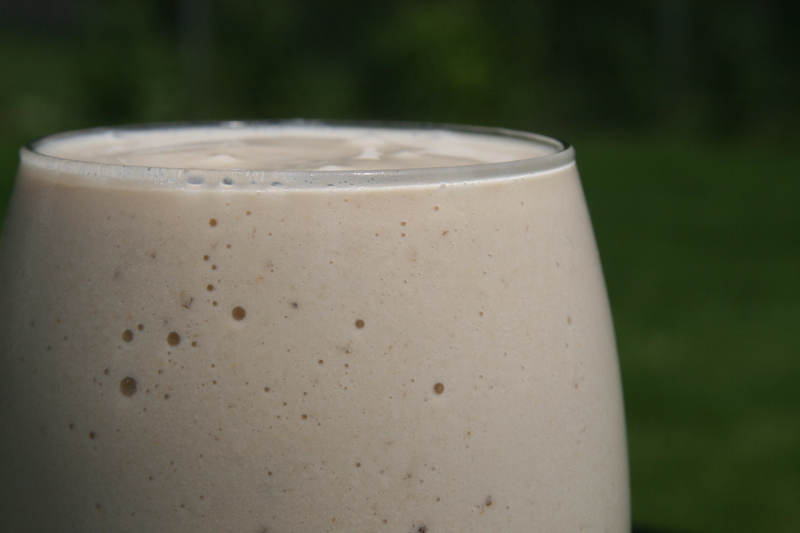 Simply add the above three ingredients to a blender (or magic bullet) and puree until smooth. For an even colder concoction, freeze the almond milk in an ice cube tray before blending. 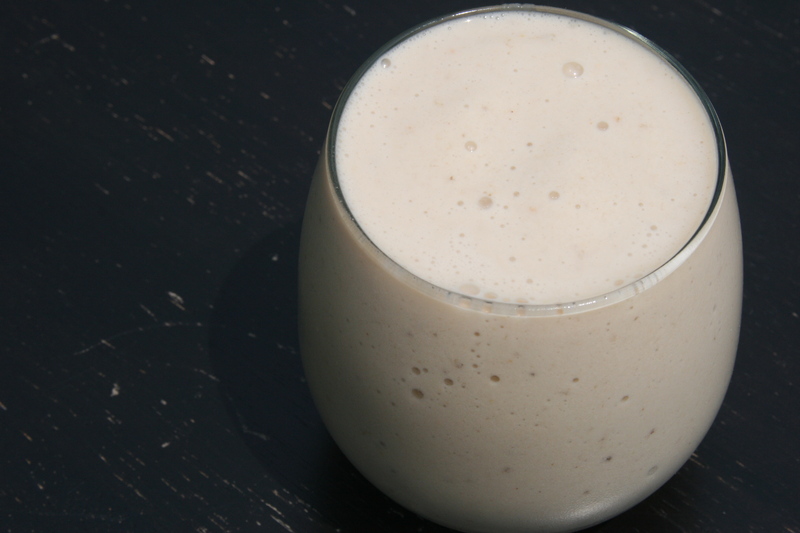 As long as you’ve got a few bananas and some almond milk ice cubes, you’ll be ready to make this recipe any time. Adding some chocolate sauce wouldn’t hurt a thing either. I am inspired by peas. Well, one Pea in particular. Mama Pea. 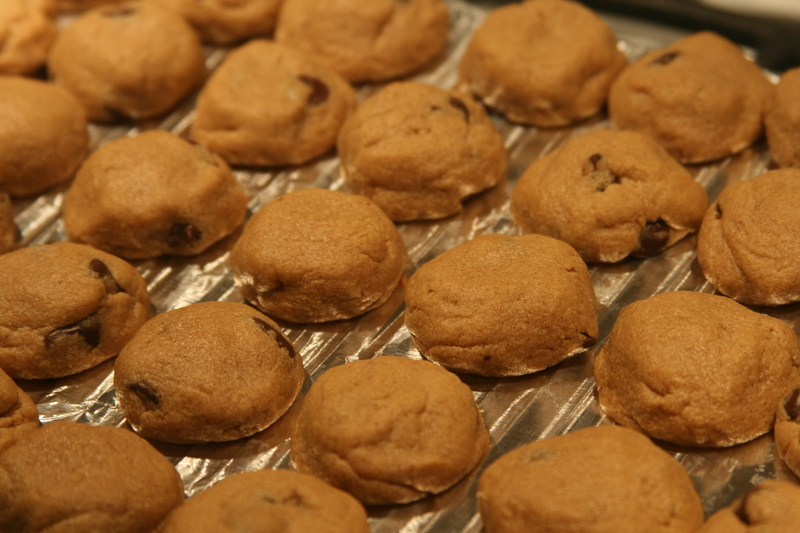 And when she says that her Peanut Butter Cookie Dough Balls are the best recipe she has ever made? 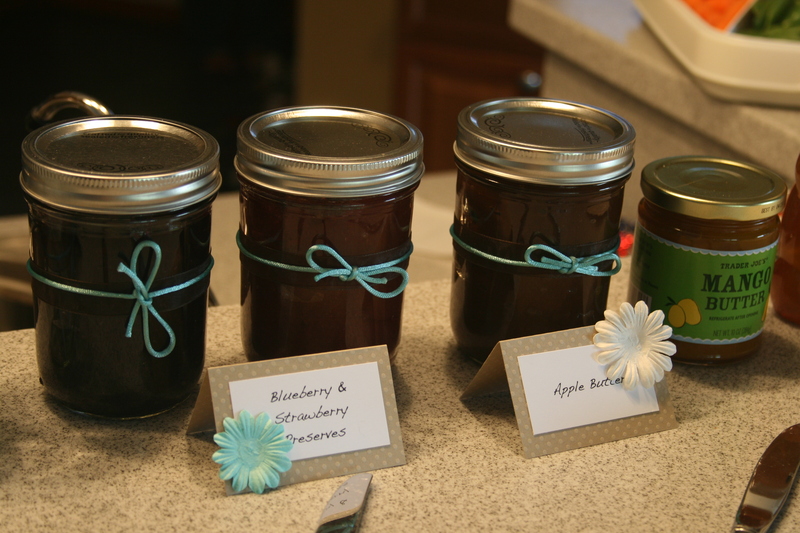 Of course I made three batches. 1. Beat earth balance, peanut butter, both sugars, almond milk and vanilla until fully incorporated. 2. In a smaller bowl combine baking powder, soda, salt and flour. 3. Add the dry ingredients to the wet, a little at a time until almost mixed together. 4. 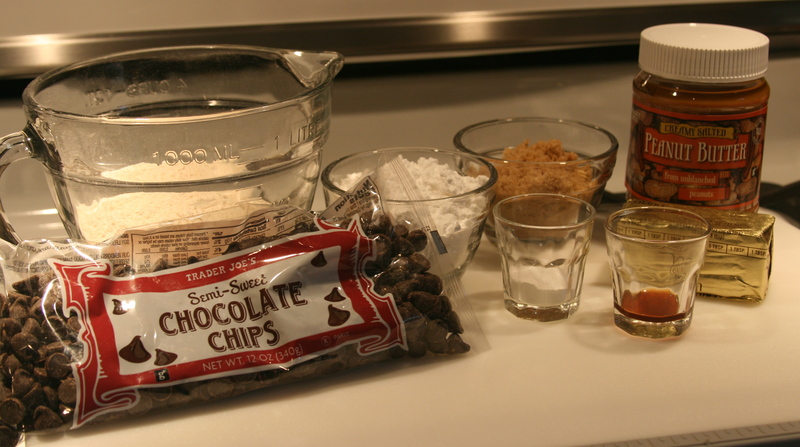 Now add the chocolate chips that you managed to not nibble on during the making of the dough. 5. Chill dough for roughly 30 minutes. 6. Preheat oven to 350*. Roll the dough into small balls. 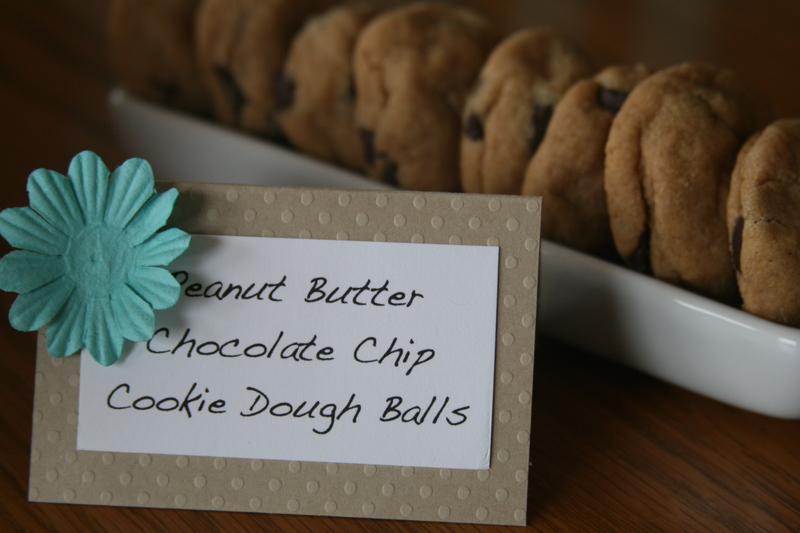 Roll these in your hands to look more like a dough ball and less like a scoop of ice cream. 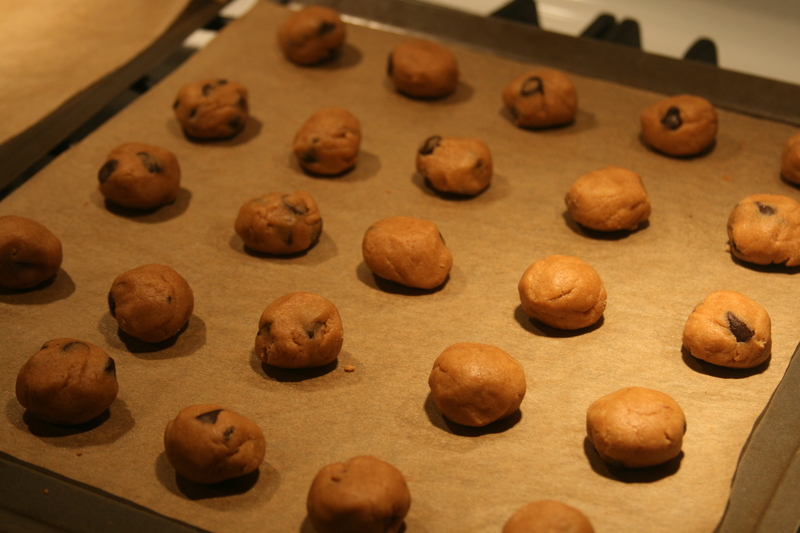 Place on a lined cookie sheet (they don’t spread so you can fit a lot on each sheet). 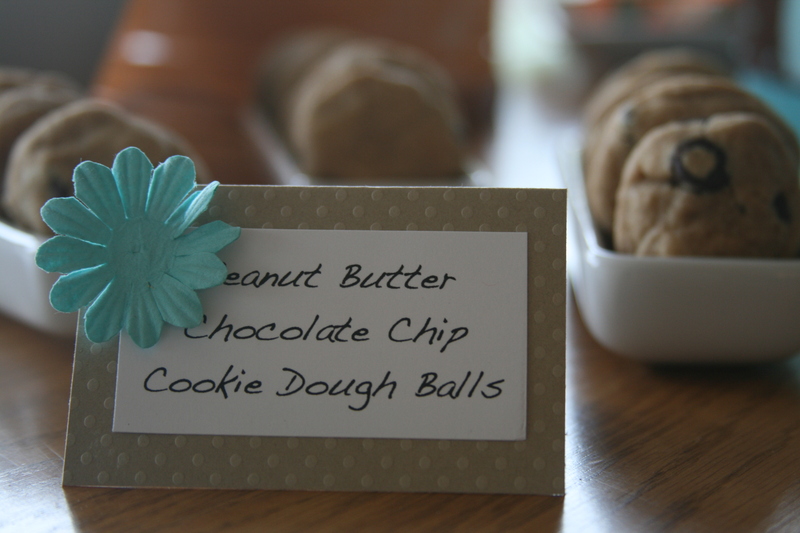 The mini cookie scoop I used made tablespoon-sized balls, perfect for a party. Bake for 8-10 minutes (mine were small so if you make larger ones the time might be slightly more). But do not overbake. I repeat, do not overbake. 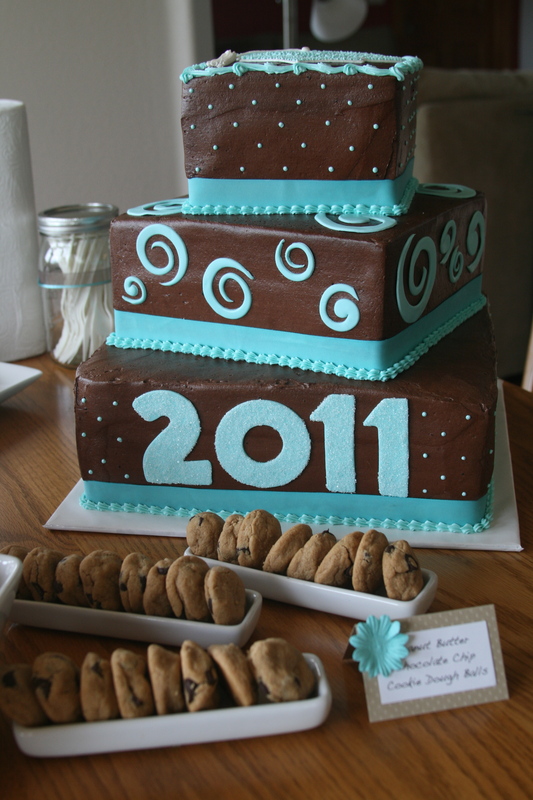 Doesn’t that make for an awesome dessert selection. Peas and Thank You, Mama Pea. 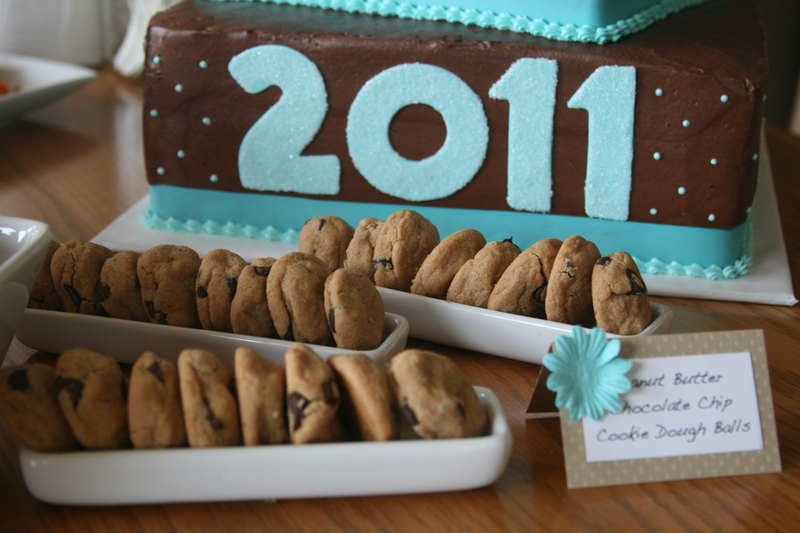 Originally, I was just going to have appetizers to serve at my graduation party to avoid attempting to find something that would be a crowd-pleaser for dinner. It is also tricky to find something that incorporates my dairy-free and no-meat diet that is still popular with everyone. Thus, the PB&J bar was born! About 5 loaves of whole-grain bread (we got a mix of sprouted, different grains as well as cinnamon-raisin bagels which Grandpa adored). Just make sure that you have plenty of knives laid out for people to use! 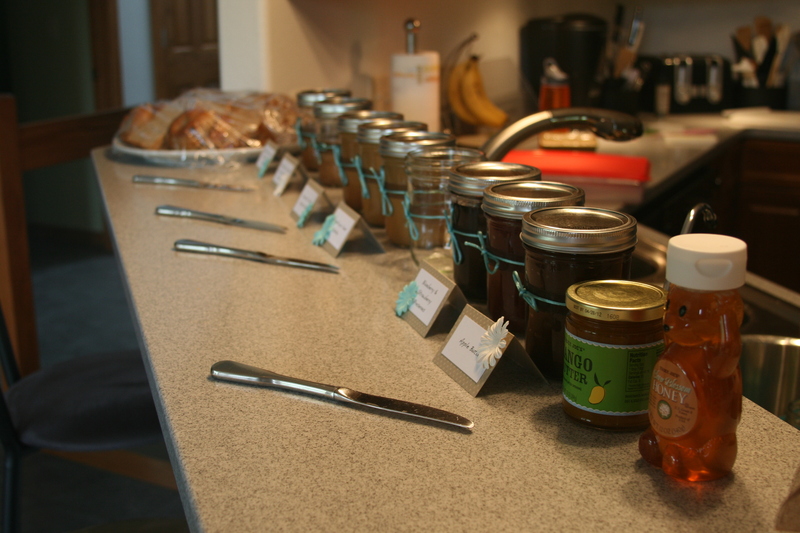 It seemed like most people put a variety of spreads on their bread and very much enjoyed everything! My cousin even dipped some crackers in one of the homemade almond butters because it was just that good! 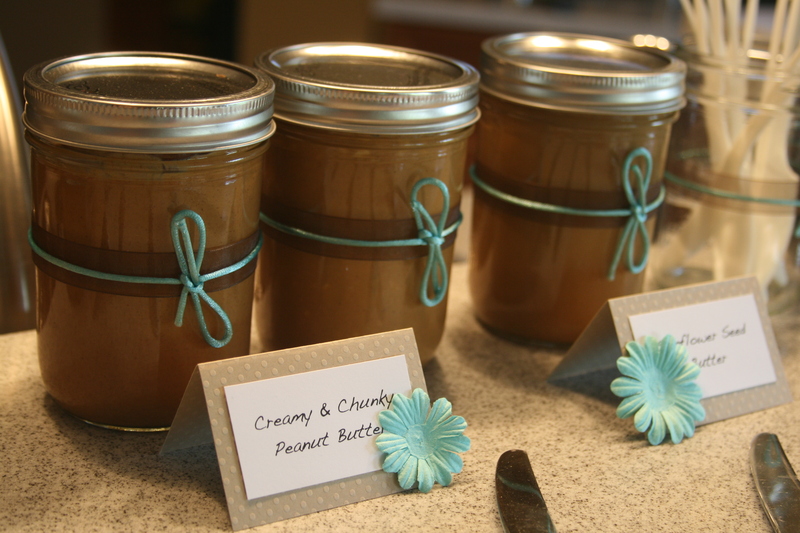 To make the almond butters, I used ideas from two recipes from The Edible Perspective. The recipes can be found here and here. To start out, I had a 16oz bag of raw almonds from Trader Joe’s. Each recipe called for 2cups of raw almonds. 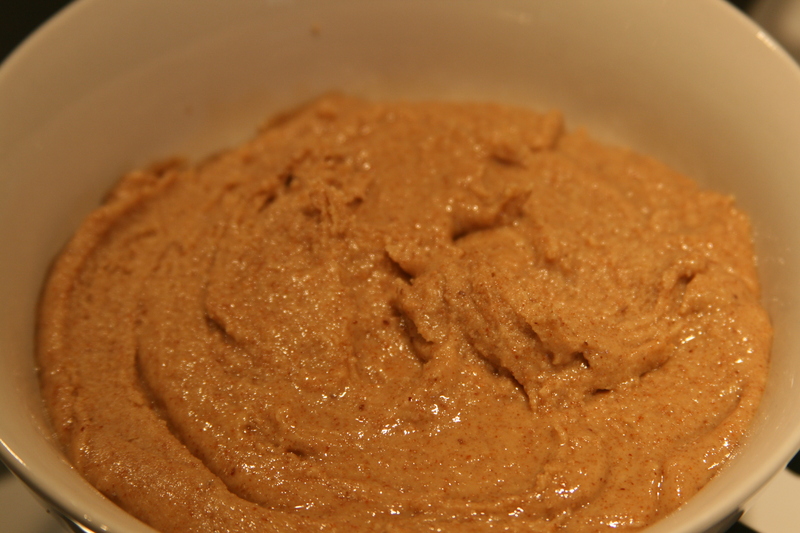 I separated the bag of almonds by weight (8oz which is just shy of 2cups) to make the following almond butters. 1. 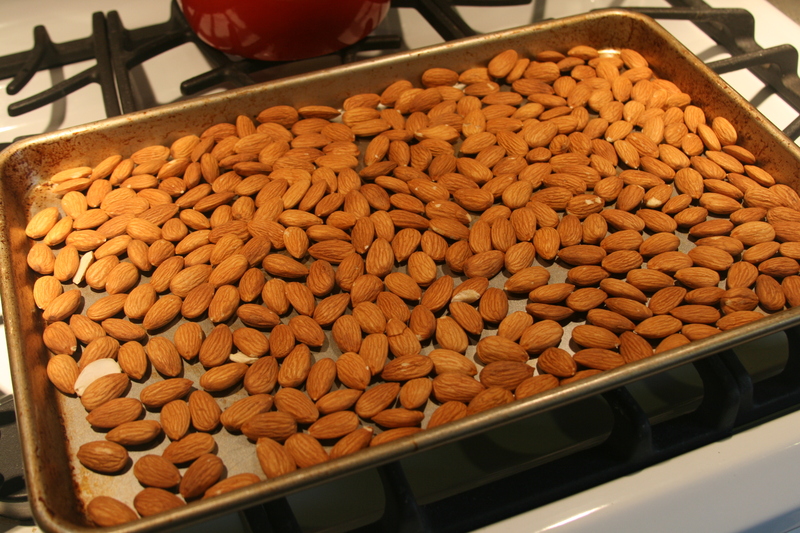 In a 325* oven, roast the raw almonds for 12-18 minutes, flipping every 4-5 minutes. Let cool for 5 minutes on the baking sheet. 2. 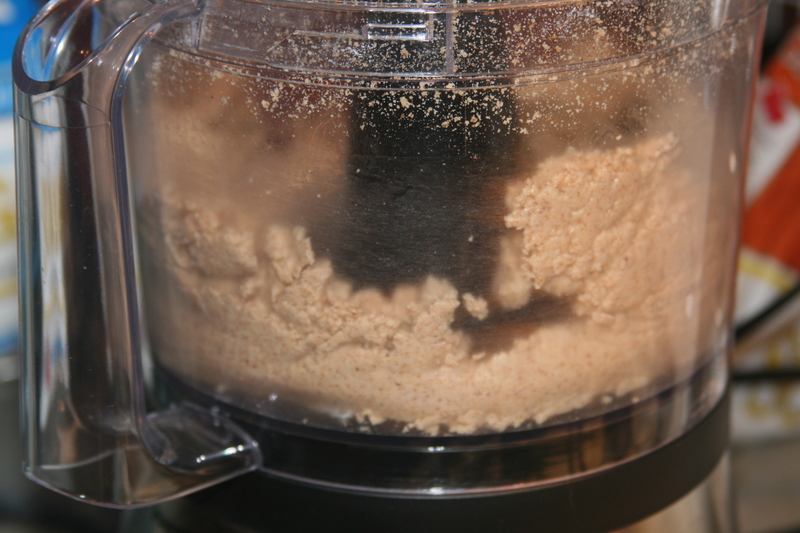 Place the almonds in a food processor and turn on for 6-10 minutes, scraping down the sides of the bowl occasionally. Eventually it will start to look more and more like almond butter. You can add additional oil at this point if it isn’t starting to come together (mine did no problem so I did not need to add additional at this point). 3. Add in the desired additions and mix until incorporated. 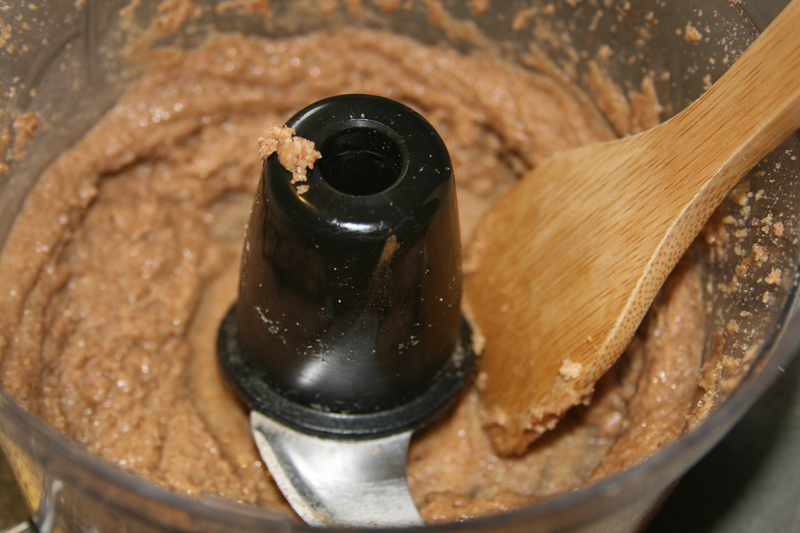 At this point, my almond butters stiffened dramatically so I added grapeseed oil to both to reach the consistency I wanted. 4. 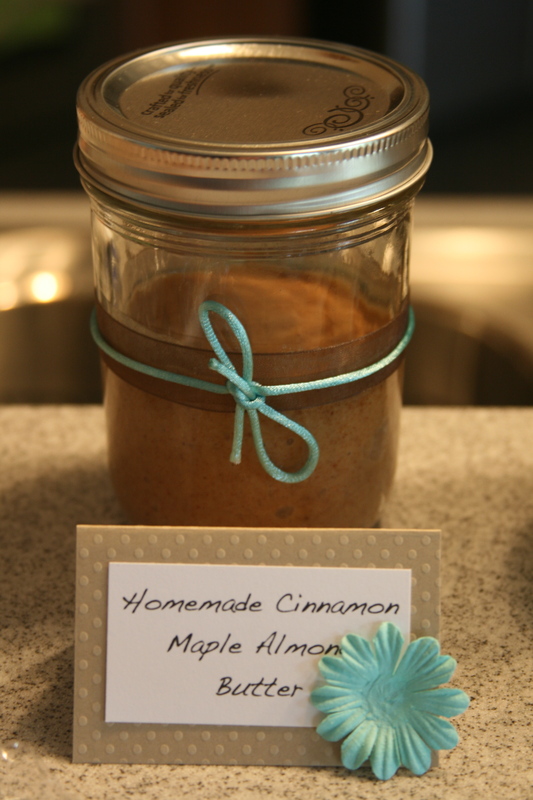 Spoon into a jar and keep at room temperature if you will eat within 2-3 weeks (both recipes make around 1 cup of almond butter, which is no problem to finish off in this household), otherwise keep in the fridge. 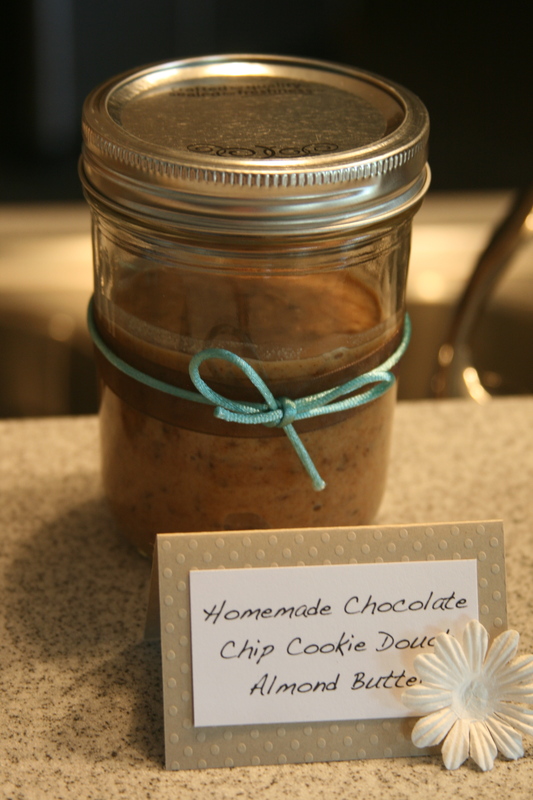 For the chocolate chip cookie dough flavor, refrigerate the base for an hour before stirring in the chocolate chunks or else the chocolate will melt all over (which probably wouldn’t actually be a bad thing ;), just would not look as much like cookie dough).